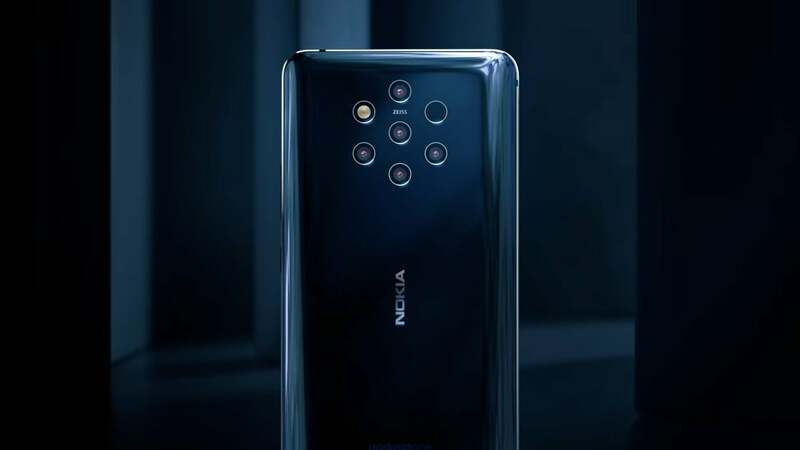 HMD Global’s Nokia 9 PureView and Huawei’s latest P30 Pro have garnered a lot of attention because of their camera capabilities. The Nokia 9 PureView is already available in the US and several European markets. The Huawei P30 Pro is the best phone the Chinese company has ever made. It is part of Huawei’s ambitious plan to overtake Samsung as the world’s largest smartphone vendor. If you are a photography enthusiast, you might be wondering whether to buy the Nokia 9 PureView with penta-camera setup or go for the more expensive P30 Pro. 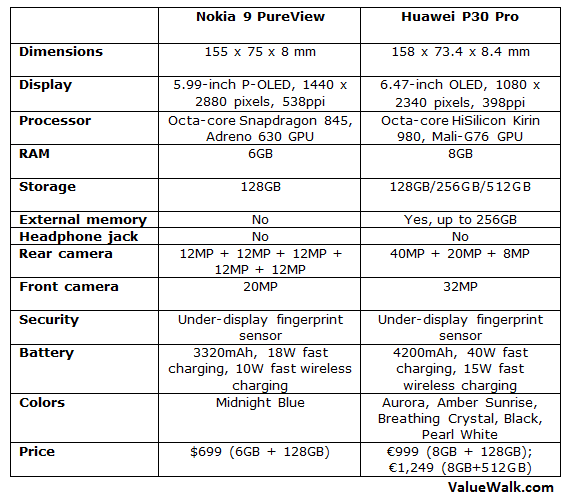 This Nokia 9 PureView vs Huawei P30 Pro comparison would help you make an informed decision. Both phones have an impressive build quality. The Nokia 9 has a metal and glass body that feels premium. HMD Global has used 6000-series aluminum and has given the metal frame an anodized finish. Unlike other phones in its price range, the device has thick bezels at the top and bottom. The device measures 155 x 75 x 8 mm and weighs 172g. On the rear panel, it has a multi-camera array. It comes in Midnight Blue color. HMD Global has done away with the 3.5mm headphone jack. It comes with an IP67 rating for water- and dust-resistance, meaning it can survive in up to one-meter deep water for up to 30 minutes. The power button and volume rockers can easily be reached on the right side. The Huawei P30 Pro has a curved display with a tiny waterdrop notch to accommodate the camera. It has an incredibly thin chin at the bottom. The phone measures 158 x 73.4 x 8.4 mm and weighs 192g. Huawei has used a metal and glass body with nine layers of what it calls Nano Optical Layer. It comes in five different color options: Aurora, Amber Sunrise, Breathing Crystal, Black, and Pearl White. The P30 Pro offers an IP68 rating for water- and dust-resistance, which means it can stay in up to 2 meters deep water for 30 minutes. The Nokia 9 has a gorgeous 5.99-inch P-OLED display, but it’s not a fully bezel-less edge-to-edge screen. There are thick bezels at the top and bottom. The colors look rich and vibrant. It offers a Quad HD+ resolution of 1440 x 2880 pixels, a 79.7% screen-to-body ratio, an 18:9 aspect ratio, and 538ppi of pixel density. The screen is protected by Corning’s Gorilla Glass 5. The P30 Pro also has an OLED screen, which means it also offers truer blacks and vibrant colors. It gets a slightly larger 6.47-inch OLED screen with a Full HD+ resolution of 1080 x 2340 pixels. It has a pixel density of 398ppi, an aspect ratio of 19.5:9, and 88.6% screen-to-body ratio. The Nokia 9 runs an older Qualcomm Snapdragon 845 processor with Adreno 630 GPU. The processor is powerful enough to play games and run multiple apps simultaneously. It’s unclear why HMD Global decided to pack an older processor when other vendors opted for the latest Snapdragon 855 chipset. It comes with 6GB RAM and 128GB of internal storage. There is no microSD card slot for external memory. The device packs a decent 3,320mAh battery with 18W fast charging and 10W Qi fast wireless charging. The battery is good enough to last a full day of normal usage. The Huawei P30 Pro is a beast when it comes to performance. It runs Huawei’s in-house HiSilicon Kirin 980 processor built using 7nm process technology and Mali-G76 graphics processor. It also features two dedicated Neural Processing Engines (NPUs) to speed up the AI-related tasks. Benchmark results have shown that it’s more powerful than the octa-core Snapdragon 845 SoC found inside the Nokia 9. The P30 Pro features 8GB RAM and three different storage options of 128GB, 256GB, and 512GB. There is also a nano memory slot for up to 256GB of external storage. It packs a monstrous 4200mAh battery with 40W ultra-fast charging and 15W fast wireless charging. It also offers reverse wireless charging, allowing you to charge other devices and accessories by putting them on the back of P30 Pro. Both devices get an in-display fingerprint sensor for authentication and security, allowing you to unlock the phone by putting your finger on the screen. But the Nokia 9’s fingerprint reader struggles to recognize your fingerprint. It’s annoying and doesn’t always work. HMD Global’s chief product officer Juho Sarvikas has admitted that the in-display fingerprint sensor has “limitations.” The company has promised to fix it via a software update. Until then, you are better off using the PIN, pattern, password, or the face unlock feature. The P30 Pro also comes with an under-display fingerprint sensor. Though it’s an optical sensor rather than the ultrasonic one, it’s fast and smooth. Both devices run the latest Android 9 Pie out of the box. But the Chinese company has used its own EMUI 9.1 skin on top of Android 9 Pie, which means the P30 Pro has a custom user interface and some bloatware. In contrast, the Nokia 9 PureView is part of Google’s Android One program. It runs the stock version of Android 9 Pie with no bloatware. The experience is simple, intuitive, and nearly identical to Google’s own Pixel phones. It also means that Nokia 9 will be among the first phones to get software updates and security patches. The camera is supposed to be the biggest highlight of both devices. The Huawei P30 Pro lives up to the promise, the Nokia 9 PureView doesn’t. HMD Global’s flagship has a five camera setup on the back. Each of them is a 12MP Carl Zeiss lens with an f/1.8 aperture. Two of them are RGB sensors while the other three are monochrome sensors. On the front, it gets a single 20MP lens for selfies. It all sounds great on paper, but the reality is a bit different. When you click a picture, all five lenses take one shot each simultaneously. The device then merges them into a single high-resolution picture. It takes a lot of time to process the photos and give you the final image. You may have to wait several seconds before you could look at the picture. It gets frustrating. Users have also complained that the camera app crashes when the battery is running low. HMD Global has promised to fix it via a software update. The selfie camera takes great pictures every single time. According to DxOMark, the Huawei P30 Pro features the world’s best smartphone camera. It gets a quad-camera setup consisting of a 40MP primary sensor with f/1.6 aperture and OIS support, a 20-megapixel wide-angle lens with f/2.2 aperture, and an 8MP ‘Periscope’ zoom lens that offers 5x optical zoom and 10x hybrid zoom. The fourth camera is a Time of Flight 3D depth sensor that creates a 3D image of the scene based on the time taken by light to bounce off various objects in the scene. It can shoot videos using two cameras simultaneously. On the front, it gets an impressive 32MP selfie camera with f/2.0 aperture. With the Nokia 9 PureView, HMD Global has adopted an aggressive pricing strategy. The device is available in the United States at $699, but you can get it for around $650 from online retailers. It has been priced at £550 in the UK and €600 in the Netherlands. Unfortunately, the Huawei P30 Pro won’t launch in the US due to the political controversy and security threats involving the Chinese electronics giant. In European markets, the P30 Pro has a starting price of €999 for the base model with 8GB RAM and 128GB storage. The 8GB+512GB variant costs €1,249. The Nokia 9 is a great phone with an attractive pricing. But it suffers from an older processor, an unreliable in-display fingerprint reader, and a not-so-refined rear camera setup. The Huawei P30 Pro is expensive, but it doesn’t give you a reason to regret the purchase.